You might not think too much about how your car seat and mirrors are positioned on a regular basis. It’s a “set it and forget it” type of thing, right? You purchase the car, adjust the seat to your liking, ensure you can see out of all the mirrors, and then drive off the car lot never to fiddle with the positioning ever again. Unless, of course, someone of a different height borrows your car and changes things around, forcing you to adjust until your favorite positioning is restored. However, driving experts agree the way you sit in your seat and how well you can see objects in your mirrors are two of the most important aspects of driving. It’s not solely about comfort. The way you are seated has a major impact on how well you can control your vehicle. You should be able to keep your hands on the wheel, have clear lines of sight around the entire car, be able to brake in the event of an emergency and stay the optimal distance away from the airbag. While being comfortable behind the wheel for a trip of any length is important, being seated properly and having good views from every angle are also key to driving safely. Technological advances in today’s cars have made getting your seat into the proper position a much more complicated procedure than it was in the past. Gone are the days where you simply scoot your seat forward or backward and get on your way. Many cars today allow you to adjust the distance from the steering wheel and pedals, the height of the seat, the lumbar support, the incline, the headrest, and so on. Identify where the seat buttons and/or levers are located. The first step in getting your seat adjusted properly is to play around with the seat buttons so you know what each is responsible for adjusting. These buttons are often located on the left hand side of the seat, or with a lever under the seat. Spend some time pushing or pulling each until you’re comfortable knowing how to work them. Adjust the distance from the pedals. Using the correct button or lever, move the seat track until you have a comfortable bend in your knees. 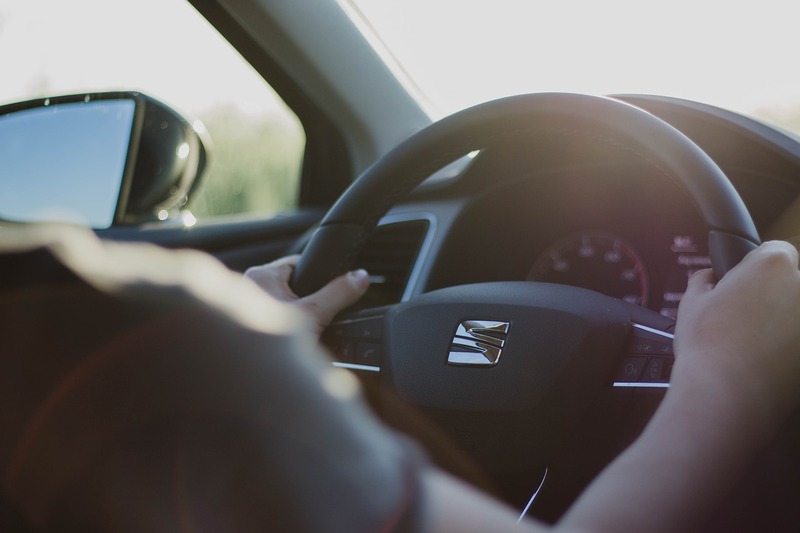 This might be the trickiest setting to get correct, because if you’re too close, your knees will hit the wheel and if you’re too far, you won’t be able to properly depress the brake pedal in the event of an emergency. The perfect distance allows you to have full power over both the brake and the gas pedal at all times. Raise or lower the seat. Start in the lowest possible position. Then, depending on your height, you’ll want to raise the seat until you have a good view over the steering wheel, the dashboard and the hood of your car. Set the distance from the steering wheel. How far you’re positioned from the steering wheel is another huge component to your safety. Your shoulders should always remain in contact with the seat, even when you’re turning. Don’t ever hunch forward when you’re driving, if the airbag gets deployed you will be too close and risk getting seriously injured. Position the seat cushion, seat back and headrest. Adjust the seat cushion until you feel even pressure from your behind to your hamstrings. Likewise, pull the seat back forward until there’s even pressure across your entire back. Newer car models often feature a button to correct lumbar support, too, so if possible, adjust that until there are no more spaces or gaps between your back and the seat. The headrest should be perfectly aligned with the top of your ears. Check your seatbelt. Before starting the car and driving off, the final step in ensuring the proper seating position in your car is to put your seatbelt on. The lap belt should be firmly across your pelvis, and the shoulder belt should fall across the middle of your collar bone. Your car is equipped with both a rearview mirror and side mirrors to further enhance the safety of your vehicle. Have you ever thought about how often you look in those mirrors to get a better view of objects, traffic and the road around your car? You probably use them much more than you even realize. However, if your mirrors aren’t adjusted properly, you could be missing things in your blind spots and jeopardizing your safety. One of the most common mistakes drivers make is to set their side mirrors incorrectly, so they’re getting more of a view of the side of their cars rather than their blind spots. After setting your seat to the right position, you should make sure to spend some time adjusting your mirrors, too. Lean to the left and right. Start with the side mirrors. Lean to the left so your head almost touches the window. Then, adjust the left mirror until you aren’t seeing the just the side of your car, but that you’re able to view the rear end of your car instead. Follow the same procedure with the right mirror. Lean to the right until you’re in the center of the car, and then position the right side mirror so you’re seeing the rear quarter-panel of the passenger side. Adjust the rearview mirror. Maneuver the rearview mirror until you’re able to see directly out the middle of your back window without the need to move your head. You should be able to quickly glance up in this mirror to see the road behind you without ever having to turn your head or body. Check your blind spots. Once you’ve adjusted your car mirrors, before driving off do a quick check of each, starting with the driver’s side. Sit as you normally would in the driver’s seat and glance in each mirror. If you can see the side of your car out of the side mirrors, repeat the first step until the mirrors point further outward. This helps give you a much wider view to eliminate those dangerous blind spots. Of course, while driving, you will still want to perform a quick over-the-shoulder check for added safety. Having your car mirrors set properly helps keep you and others on the road as safe as possible. However, it’s also important that you know how to use those mirrors correctly, too. For instance, if you’re changing lanes, know that you should first check your rearview mirror for traffic behind you. Then, turn on your signal, checking your side mirror before you switch into the other lane. Keep glancing in your rearview mirror and side mirror until you’ve safely merged. Despite the fact that modern cars are equipped with more safety features than previous models, there are still an alarming number of car accidents every year. According to the National Safety Council, vehicle deaths in the United States topped 40,000 in the year 2017. This number is down slightly from 2016, but is still higher than 2015. The reasons for these fatalities include distracted drivers, speeding, and people simply not bothering to wear their seatbelts. You probably know someone who has been in some type of car crash – if you haven’t been a victim of one yourself. This makes it even more important to properly adjust your car seat and mirrors. These adjustments both improve your ability to see the road and keep you aware of your surroundings. Good visibility is paramount to safety on the roadways, so it’s important that you become oriented with the seating and mirrors in your car. Keep in mind that sitting in a car is not the same as sitting at a desk working. Your arms are higher and your legs are extended farther forward. Plus, your body experiences up and down vibrations from the road. While cars today offer seating that is definitely comfortable, when shopping for a car it’s important to make sure the vehicle is a good fit for your body type. To maximize safety, comfort and minimize the risk of an accident, you should be able to safely reach the pedals and controls, have sufficient headroom, be able to sit high enough in the driver’s seat to see out of the windows, and reach the steering wheel without stretching your arms. Be aware of your surroundings at all times. When you’re driving, that’s the only thing you should focus on. Put cell phones away, set the radio station before you pull out of the driveway, and save the snacks for the rest stop. This helps you stay aware of traffic and the road in front of and behind you. Obey the laws of the road. Go the speed limit, pay attention to traffic signs, come to a full stop at red lights and stop signs, and so on. Maintain a safe distance. Never tailgate. Allow for at least a four-second space between your vehicle and the car in front of you. Be smart about clothing choices. High heels and thick soled shoes may not allow you to feel the gas and brake pedals sufficiently. Additionally, wide brim hats could impair your vision and block sight lines. Since 1990, DriveTeam has provided the most comprehensive driver training possible from instructors accredited and licensed by the state of Ohio. We have graduated almost 50,000 students from our corporate driver training, teen driver education classes, and Emergency Response Operations Courses (E.R.O.C.) to ensure all drivers know how to be safe, confident and conscientious while behind the wheel. For more information about our driver training programs, please contact us today.